When Azure AD authentication is combined with the new Azure Data Lake Storage Gen 2 capabilities, users can also take advantage of granular file and folder access control using POSIX-style access permissions and access control lists (ACL’s). RBAC for Azure Resources can be used to grant access to broad sets of resources across a subscription, a resource group, or to individual resources like a storage account and blob container. 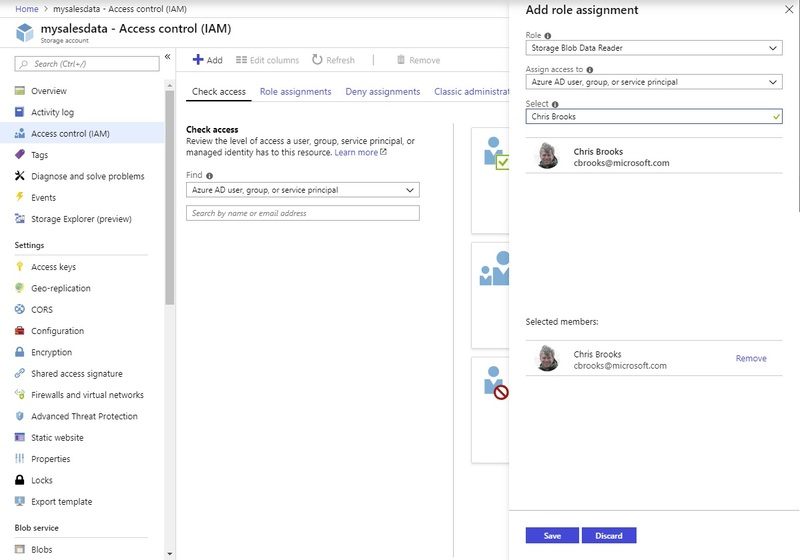 Role assignments can be made through the Azure portal or through tools like Azure PowerShell, Azure CLI, or Azure Resource Manager templates. Azure AD authentication is available from the standard Azure Storage tools including the Azure portal, Azure CLI, Azure PowerShell, Azure Storage Explorer, and AzCopy. We encourage you to use Azure AD to grant users access to data, and to limit user access to the storage account access keys. A typical pattern for this would be to grant users the "Reader" role make the storage account visible to them in the portal along with the "Storage Blob Data Reader" role to grant read access to blob data. Users who need to create or modify blobs can be granted the "Storage Blob Data Contributor" role instead. Developers are encouraged to evaluate Managed Identities for Azure resources to authenticate applications in Azure or Azure AD service principals for apps running outside Azure.